Many fears come with filing bankruptcy. Will you lose your business? Will it take a very large portion of your life? Some of these fears are valid and some are not. Mostly it depends upon your circumstances and the type of bankruptcy you have filed for. But one big fear always hovers. Will filing for bankruptcy hurt your credit score? Truthfully, no one can tell you that for sure. It’s darn near impossible to predict how your credit score will be hurt because of many reasons. Chief among them is the condition in which, your score is at the time you filed for the bankruptcy. Bankruptcy can impact your credit score for a time of up to ten long years. While that may scare you off from filing bankruptcy, not filing it in time of need can have all sorts of negative impacts in the future. Your credit score will take a hit of anywhere between one hundred and sixty points to two hundred and twenty points. But it depends on whether you have filed for Chapter 7 or Chapter 13. Then on your credit report, your bankruptcy will be shown differently. For seven years, your bankruptcy may be displayed on your credit report. Provided you have filed for complete Chapter 13 bankruptcy. Your discharged debts will stay on your credit report for the same duration of time also, after they are discharged that is. You have opted to repay your loans in three to five years. So the debts discharged have a chance of staying on your credit report longer. Longer even after the bankruptcy has been resolved. On your credit report, your bankruptcy will stay on for ten years. Provided you have filed for complete Chapter 7 bankruptcy. The debts associated with this chapter 7 bankruptcy are discharged within the first few months. Meaning, chances are, they will be taken off your credit report a few years before your bankruptcy resolves. As the items on your bankruptcy get older, they will have less effect on your credit report. Of course, you had your reasons for filing bankruptcy. Therefore, your credit score will take a hit for the time being. This actually gives you a chance to learn from your past mistakes and make better, informed decisions about the future in the handling of your finances. Make sure to check your current credit score on regular basis. Make sure everything is being reported correctly. And if not then report the corrections immediately. Reestablishing your credit is of utmost importance. You might be in for a wait of ten years or seven years, depending on which Chapter you filed for. If by chance you have an account that is less than ten years old, then waiting for your bankruptcy to clear will put you so far back that you might as well not have had an account to begin with. In other words, you start with step one. In the future, make a better study of all credit cards, what they offer, what you are gaining and if they will be beneficial for you in the future. 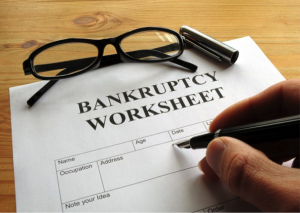 Talk to Attorney Edwin Walker of Walker Law for more information about the bankruptcy process in West Palm Beach, FL by calling (561) 689-1512. This entry was posted in BANKRUPTCY, CHAPTER 13, Chapter 7 and tagged bankruptcy attorney, bankruptcy credit score, chapter 7 bankruptcy, filing chapter 13 bankruptcy. Bookmark the permalink.